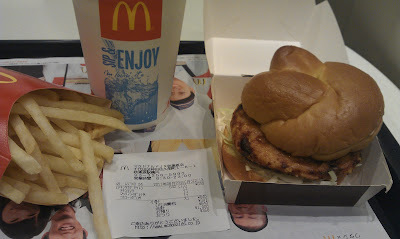 The Chicken Tatsuta was apparently a popular McDonald's Japan menu item back in the 90's, and they have been bringing it back for one-month limited time promotions. Unlike the linked CNN article, mine actually looked quite appetising, and very close to the promotional photos. According to Wikipedia, Tatsuta is a special way of deep frying. The bun was the softest, and freshest bun I have ever had at a McDonald's, but unfortunately, the chicken was a bit of a let-down, as it had a breakfast sausage texture and was rather chewy. At 640 Yen, it was a very expensive lunch.